Christopher Schwab, a member of the cross country and track and field teams, poses for a portrait outside Tiger Stadium on campus in Henrietta, NY, Dec. 6, 2016. For the 2015–2016 school year, RIT had 55 student athletes who were recognized and earned the Liberty League All-Academic award, an honor that can only be achieved by having a 3.3 grade point average or higher on the 4.0 scale. The award is intended to give recognition to students who not only work hard on the court, but in the classroom as well. Last year's record number of athletes just shows how integral academics are in the RIT athletic program. “We try to reinforce these things with our athletes, how critical their academic lives are here and how important it is for us to see them successfully academically.” said the executive director of Intercollegiate Athletics, Lou Spiotti Jr. The athletic program does a lot to assist their student athletes, from tracking their grades to checking in periodically. Student athletes — and students in general — can access tutors and academic support whenever they need to. The extra support helps balance out any problems there may be. Fourth year Biomedical Science major and volleyball team co-captain, Sarah Szybist, was one of the many students to receive the award. Not only was she able to juggle her difficult major and a challenging volleyball season, but she was also able to maintain a GPA much higher than the qualifying point. Christopher Schwab, a fifth year Electrical Engineering student and another outstanding recipient, agreed on the subject. “It was really nice to get that kind of reward, because I am putting a lot of effort in on both fronts — academics and athletics. It’s really nice to be acknowledged for that,” he said. 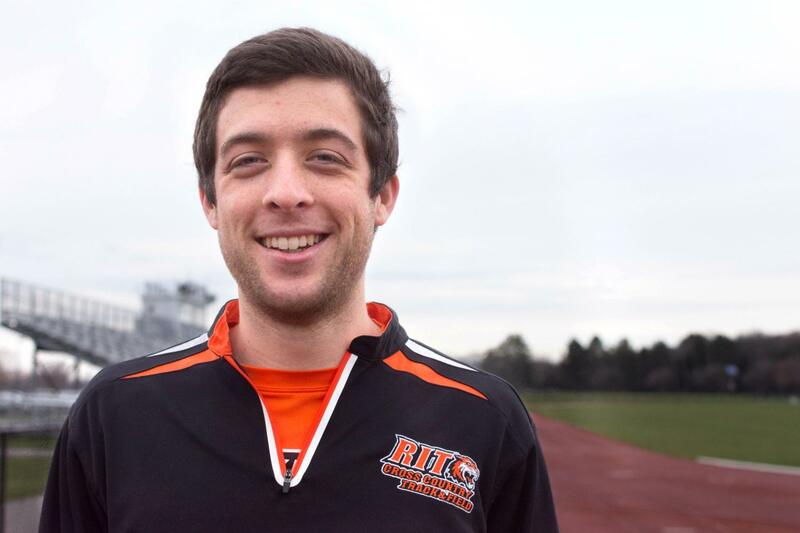 Schwab a fifth year Electrical Engineering major, runs cross-country and track and field. He was also able to maintain a GPA much higher than the qualifying point, along with being an athlete during all sport seasons. “I enjoy the work and it’s hard at times, but I am putting in the effort and it’s paying off,” said Schwab. This attitude of working hard at both academics and athletics is not something just found in these two student athletes. It can be found all over the board, in all sports, and in all types of students. "We've got a population of nearly 700 student athletes who want to achieve in the classroom." “We’ve got a population of nearly 700 student athletes who want to achieve in the classroom. They are not just satisfied with being good athletes,” he continued. Another thing that helps the athletes succeed in the classroom is the unique environment that RIT offers. The common drive to achieve is an attitude that affects everyone around it, usually influencing atheletes in a positive way. “There is some healthy competition amongst the teams, amongst the student athletes, that they see others who are doing well, and they want to do the same,” explained Spiotti. At some other schools, being smart and working hard is not always popular. Academics are not always viewed as being as important, and are put second to athletics. “Sometimes [the athletes] come from programs where they are ostracized, isolated, and sometimes bullied because they do well in a classroom,” stated Spiotti. However, the opposite is true at RIT. “There’s a healthy environment that fosters academics amongst the student athletes — no one’s ostracized, no one’s isolated, no one’s ridiculed, and no one’s bullied. You’re admired,” explained Spiotti. This environment and these attitudes are crucial for athletes to be able to do well in both areas. Being successful on the court, in the pool, or in the gym is very important, but there is a lot more to it at the collegiate level. Students are no longer just looking for a good team to be on, they are also looking for a good program to be a part of. “At the end of the day, they know they are here for an education,” explained Spiotti. "I'm a student athlete, and student comes before athlete." Szybist confirmed this. “I’m a student athlete, and student comes before athlete,” she said. The number of student athletes who earned the All-Academic award showcases just how much this mindset can make a difference. Their hard work and dedication does not go unnoticed, and every single on of them deserves the recognition.